This week, allow me to point you towards one of my new favorite blogs, Dynamic Music Teacher, written by Dr. Travis Baird, Performance Coach and Musician Health Specialist. In the series, he touches on three specific topics, What is Mindfulness, 6 Crucial Moments, and Reaching Peak Performance. 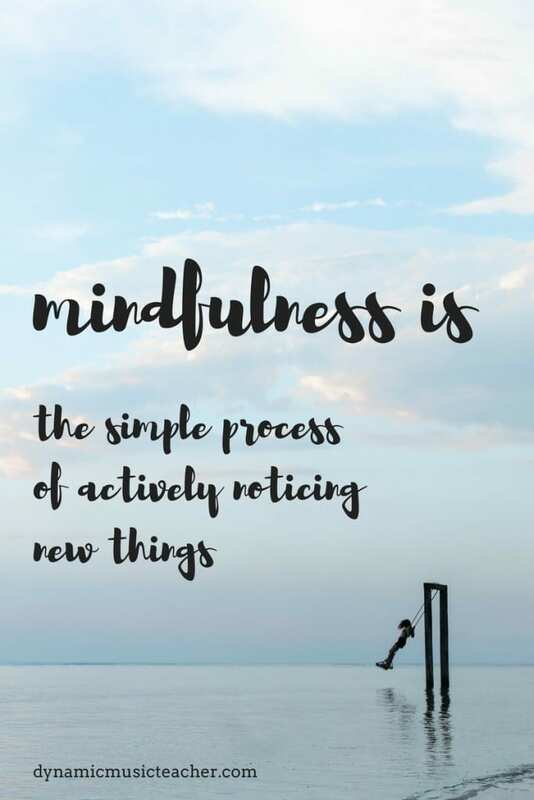 Mindfulness is “the simple process of actively noticing new things.” For example, when you are writing something down take a moment to look at the way you write, the utensil you are using, and take a few seconds to notice what is going on around you. By doing this little exercise, you are practicing the art of mindfulness. At first mindfulness may be a struggle but you can set goals for yourself. To start practicing mindfulness you could stop hendering yourself with social media and spend more time listening intensely to the songs you love and appreciate. Anxiety can take a toll on many musicians, for example, experiencing nervousness before a show or teaching a new student. Exercising mindfulness can decrease anxiety and make you feel better overall before you take on a task. For example, before you practice, take a few deep breaths and notice how your body feels. Think about what you are about to play and how the music makes you feel then continue slowly inhaling and exhaling a few times. When you are about to perform, think about what the room and audience looks like. Try to feel your instrument and observe the sound your body makes when you move. Take steady slow breaths and then draw your attention to the music you are going to perform. Teaching can also be tough sometimes for many instructors- especially when the student won’t cooperate or doesn’t understand what is being taught. Mindfulness is very important when teaching. Listen to what your student has to say and while your student is practicing, listen intentionally. Observe your student as much as you can and try to find out the best ways they can learn. By taking advantage all of these little techniques, you can learn how to incorporate mindfulness into your daily life and you will likely become less stressed and anxious. Mindfulness teaches us how to step away from the world and analyze our true thoughts and feelings. Mindfulness can help you build stronger relationships with others and promote self-growth as well. For more in-depth reading, visit the Dynamic Music Teacher blog!